Hello friends, thanks for calling by. 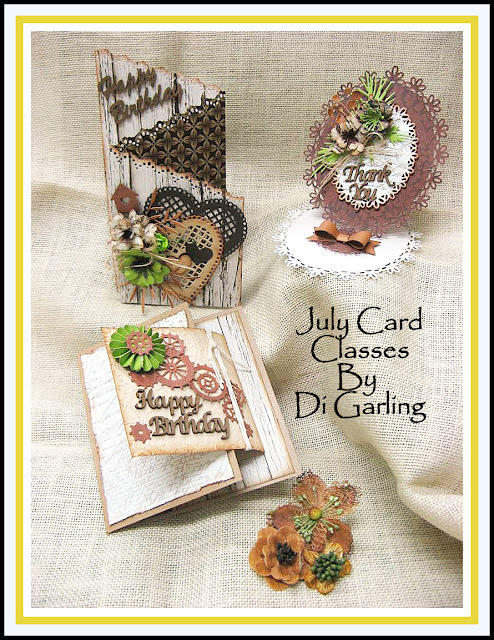 Today I have the three cards that we will be making in both of our July Card Classes. A lovely earthy colour palette with a touch of vintage & as always, lots of handmade flowers too. The one on the back right is an "Easel Card" with lots of attention to detail & adorned with handmade flowers, the one on the left is a great "fancy fold" & super easy. The one in the front is a male one with a little bit of difference. purchase in our store at The Entrance too. We also thought we had better start thinking about Fathers Day as it is just around the corner so this lovely male card would also be great for Fathers Day too. Hope to see you in class, but if you cannot make it to class, we also make kits that can be mailed out. Ring the shop for details. Class Times Friday 10th July from 10am to 2pm OR Friday 24thth July from 10am to 2pm Cost is $35 for the 4 hour class & includes all materials & equipment.